Blogger is a very good platform to explore your ideas in the web world. Yesterday my friend asked me, how to customize blogger template. 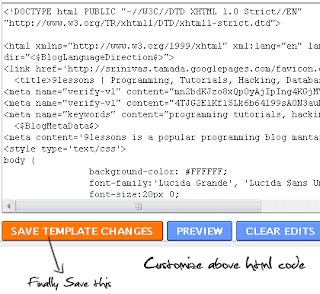 So i publish this article about customizing blogger template. If you have any queries just comment. Sri Anna ..What template u r using for this 9lessons blog in blogger ? .What template u r using for this 9lessons blog in blogger ? Hi! Please, could you tell me how to create a template for posts? I need to automatically print the id or number of the post inside it. How could I do it?